According to Rice University Engineers, pillared graphene would convey heat better if the theoretical material had a few asymmetric junctions that produced wrinkles. Rice Materials Scientist Rouzbeh Shahsavari and Alumnus Navid Sakhavand first constructed atom-level computer models of pillared graphene — layers of graphene linked by covalently bonded carbon nanotubes — to discover their electrical properties and strength along with their thermal conductivity. In a new study, they found that controlling the joints between the nanotubes and graphene has a substantial impact on the ability of the material to direct heat. That could be crucial as electronic devices reduce in size and require more advanced heat sinks. The research has been published in the American Chemical Society journal ACS Applied Materials and Interfaces. Researchers who explore or are working to create pillared graphene have mainly viewed two features of the theoretical material: the pillars’ length and their distance from each other. The new research recommends that a third parameter — the nature of the junction between the nanotubes and graphene— should also be well-thought-out. 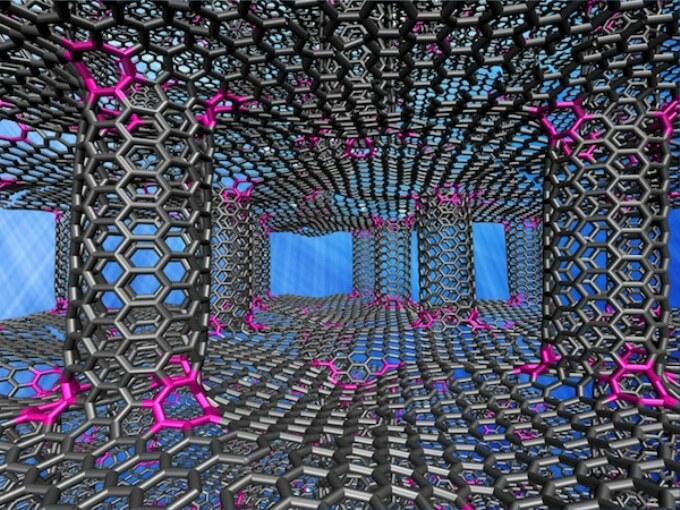 A seamless connection between flat graphene, the atom-thick form of carbon and round nanotubes requires modifications to their typical six-member carbon rings. The simplest way is to provide half the rings at the junction an additional atom. Six seven-member rings alternating with six six-member rings allow the sheet to make a 90 degree turn to be transformed into the tube. But that is not the ideal configuration for heat conveyance, according to the Rice team. It found that substituting six heptagons with three octagons would enable the turn while marginally stressing the graphene. That would wrinkle the graphene sheets’ bottom and top while not considerably altering transport at the junctions. The Researchers naturally expected the wrinkles to lower thermal transport and were astonished to find that thermal movement across the “in-plane” graphene became quicker with wrinkles. They established that having fewer rings in the junctions between graphene and nanotubes resulted in less scattering of heat-carrying phonons, which preserved them onboard for the bumpy ride. Measured along the longest plane, models with the octagons were almost 20% better at conveying phonons than those without. Our results show that subtle features such as this junction configuration have a significant impact on thermal transport. Given the current needs in thermal management and device miniaturization in many nano- and microelectronics, this study provides a new degree of freedom to play and improve thermal transport. The Researchers thought phonon movement through the nanotubes, which they already knew was more sluggish than in graphene, might be slower still under the impact of the octagons, but the changed interface did not seem to have a substantial effect. As the junctions can adopt a number of different geometries based on the chirality and radius of the nanotube, there are numerous more probable configurations to be modeled, he said. The research was supported by Rice University and the National Science Foundation (NSF). Computing resources were supplied by Rice’s NSF-supported DAVinCI supercomputer administered by Rice’s Center for Research Computing and procured in collaboration with Rice’s Ken Kennedy Institute for Information Technology and resources supported by the National Institutes of Health, an IBM Shared University Research Award, Cisco, Qlogic and Adaptive Computing.